The Traverse is one of four GM full-size crossovers with seating for 8, and its differently styled GMC and Buick brothers (the Acadia and Enclave) would be the only others still in production today. The up-to 288-hp V6 engine, ultra-smooth ride and elbow room are all the same across all three GM choices, but if you need an affordable and utilitarian people-hauler, read on. While there are trucks that do better than the Traverse’s 17/24 mpg with the default front-wheel-drive (FWD) configuration - or 1 mpg less with all-wheel drive (AWD) - its 5,200-pound optional towing capacity and nearly 117 cubic feet for cargo (24 with the seats up) make it mighty tough to argue with the Traverse’s utility on a 6-speed automatic transmission. Only the LTZ takes full advantage of the 3.6-liter V6 however, with all the lower trims shorted about 7 hp and 4 lb-ft of torque due to their single exhaust outlet. The base LS and LT1 are the only trims carrying 8 passengers by default, but the 7-passenger LT2 and LTZ can have their second-row captain’s chairs swapped out for the bench seat. Being a budget offering, the LS comes with only expectedly basic amenities like power accessories, air conditioning and a 6-speaker CD and MP3 playing stereo with auxiliary audio jack and satellite radio connectivity - but moving up to the LT1 affords inclusions like heated side-view mirrors, rear parking sensors and leather touches. The LT2 antes up with tri-zone automatic climate control, a 10-speaker Bose stereo with USB connectivity, rear audio controls, power liftgate and a rear-view camera in the rear-view mirror. At the top of the line the LTZ offers leather upholstery, heated and ventilated power front seats, driver memory, Bluetooth connectivity and remote ignition. Most of the upper-tier features are available as options, and highlights of the remaining list include a trailering package, navigation system with real-time traffic, dual sunroofs and a rear-seat DVD entertainment system. 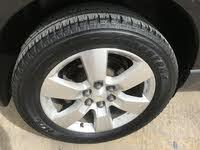 Sure, the Traverse might not be the most nimble thing on the road, but drivers agree its ride couldn’t be smoother, and opting for the bigger tires makes maneuvering and stopping a bit more snappy. Otherwise drivers are hard-pressed to find something missing from this highly capable family hauler. Usually quadruplets are born minutes apart, but GM’s GMC Acadia, Buick Enclave and Chevrolet Traverse differ in age by an entire year, with the Saturn Outlook born alongside the Acadia only to be discontinued 2 years later with the demise of the maker. The Acadia came first in 2007, with the upscale Enclave as its closest sibling and the affordable Traverse taking up the rear. 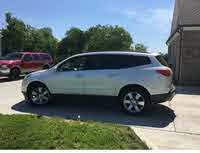 This affords GM the ability to offer more features in the upscale editions while discounting the Traverse with more reliable and inexpensive hand-me-downs. As such the Traverse has only gained a USB port and a few options since its 2009 debut. The trim lineup is exactly the same, but some of the features have moved around in the option packages - nothing major, just make sure you're getting what you want. 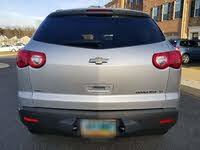 Being a Chevy, the Traverse has the usual leaks, squeaks and beeps. Some are just minor annoyances - the seats may not like to move, and the Bluetooth connectivity does not like older phones. As for some of the bigger issues - the engine might stall from water leaks corroding connectors, the transmission leaks in colder climates, and the steering gear bushings may need to be replaced sooner than most drivers would prefer. If you don't need so much USB connectivity, a used Traverse from the first model year could be a downright decent bargain - the $10,000 sticker discount definitely sweetens the deal. 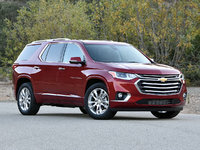 Although typically it is best to avoid first-year model runs, the Traverse is based in a several-year-old platform that has already gone through an engine evolution, making the earlier Traverse a somewhat less risky buy for those on a tight budget. The 2020 Chevrolet Traverse has been announced, but it is not yet available for purchase.